As you might have noticed, my blog now has a new look, and of course, my new logo! For my branding I was wanting to achieve a soft, delicate look. I have always liked the look of brands such as Crabtree & Evelyn and Jurlique's packaging. When a friend of mine saw my logo, she said it looked strangely familiar. She then went on to say that it reminded her of Crabtree & Evelyn. I was very excited at that comment because it meant that I have achieved what I had set out to do. Although the process was a quick one, I paid great attention to the detail that went into my logo, right down to the baby leaves and petals. Being the stickler for detail that I am, they had to be JUST RIGHT! Anyway, I thought I'd take the opportunity to share with you about how I came up with the name for my store. The journey began back in November 2011, when I stumbled upon a "For Sale" sign in the window of a wool store in Sassafrass. Owning a wool store had become a sort of dream of mine since I started my knitting adventures. I would frequent my favourite wool shop, Sunspun, buy up wool for projects which to this day I still have not yet started, and basically find any excuse I could come up with just to be able to step in there so I could spend hours around the lovely yarn and all things knitting. I would say to Dave, "If they ever sold the shop I'd buy it." So, when an existing wool store was up for sale, I saw it as my chance to create my own shop atmosphere, a place where others would also love to come and spend their time, and to be able to create a community around something that I love doing. For a few months Dave and I explored the possibilities of buying the wool store business but nothing eventuated. A big reason being I have been a stay at home mum since Amber was born and taking on the business would have meant that I was no longer able to look after them for the majority of each week. This was not something we really wanted to sacrifice. During that time there was also an online wool store business for sale. We explored this avenue also but basically could not see the worth in buying over such a business when it actually seemed easier and cheaper to start up our own! Now I had read this scripture many times before but I never related to it from a business point of view. And the fact that I was considering a business which involved wool and fabrics, it seemed so apt! (For those of you who don't know what flax is, it is a plant which linen is made from.) So, when I reached the point in my journey of starting my own wool store and thinking of a name for it, it seemed only appropriate. 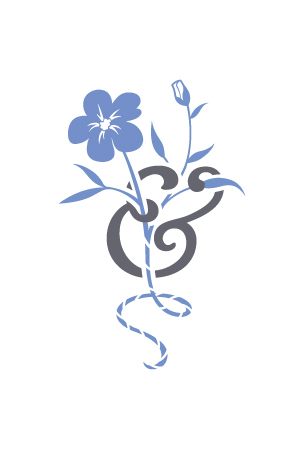 The picture in my logo is of a flowering flax plant with some yarn trailing down from its stem and it simply represents "Wool & Flax". I hope you like it!